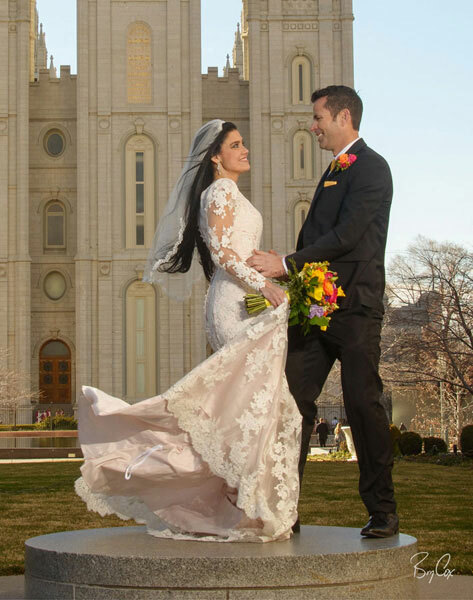 Rebecca’s wedding was beautiful! These two are great together and the weather worked out wonderfully. While I’m working on and designing her album, I wanted to share some of my early favorites as a sneak peek for you all to see. Here framed in the nook, we have her veil blowing in the wind. 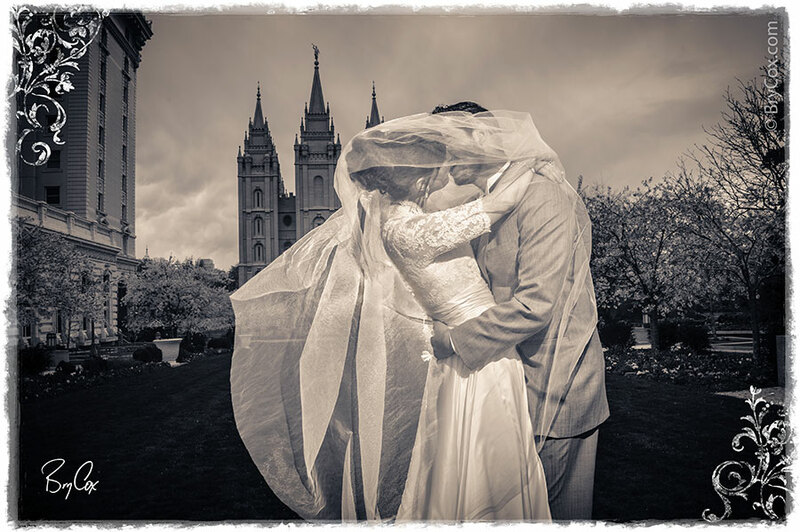 She had a beautiful, long veil, and it caught the wind many times throughout the day, adding a lot of fun to the photographs. 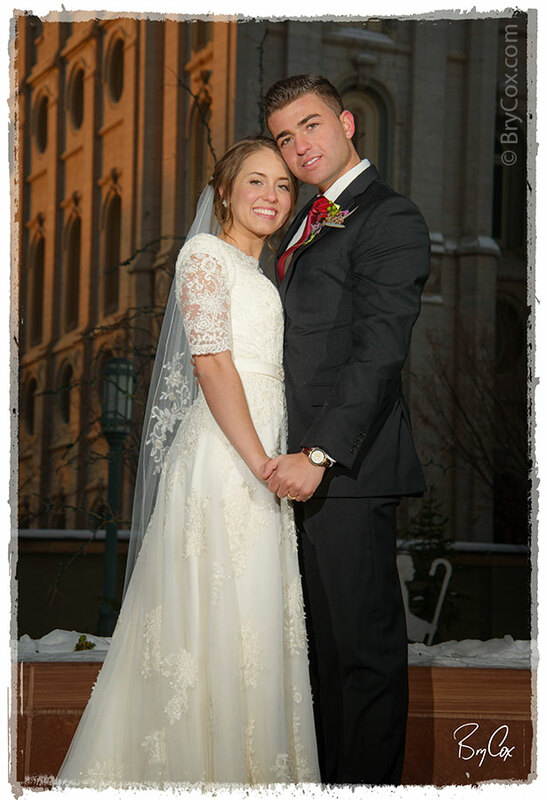 I love this portrait of the two of them – a nice, mid-length portrait of them leaning together, newly married. We had a beautiful, sunny day. So with the right lighting, I was able to make them look beautiful while at the same time capturing this gorgeous and deep blue sky with clouds glowing from the sun. 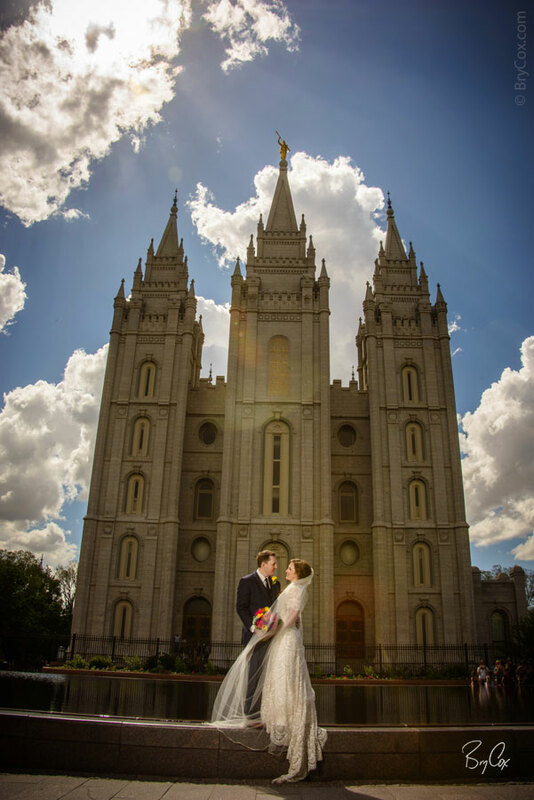 I love how the light of the sun comes through the clouds, down on them, creating a directional lens flare, all framed by the temple. 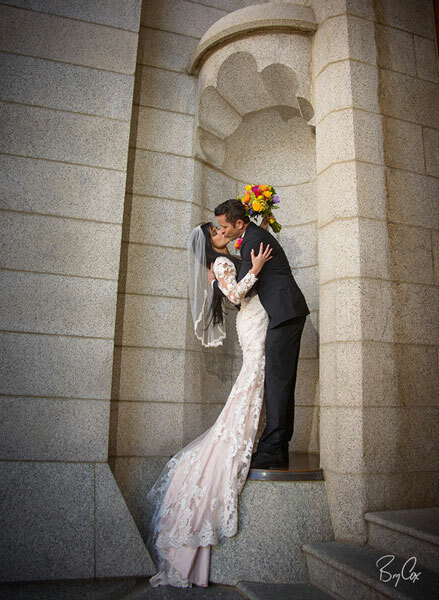 Here Rebecca is holding her veil for this wonderful kiss. And some dancing in the wind to the delight of a full paparazzi crowd of Chinese tourists behind me. They cheered and clapped, and snapped a ton of photos during this dancing sequence. 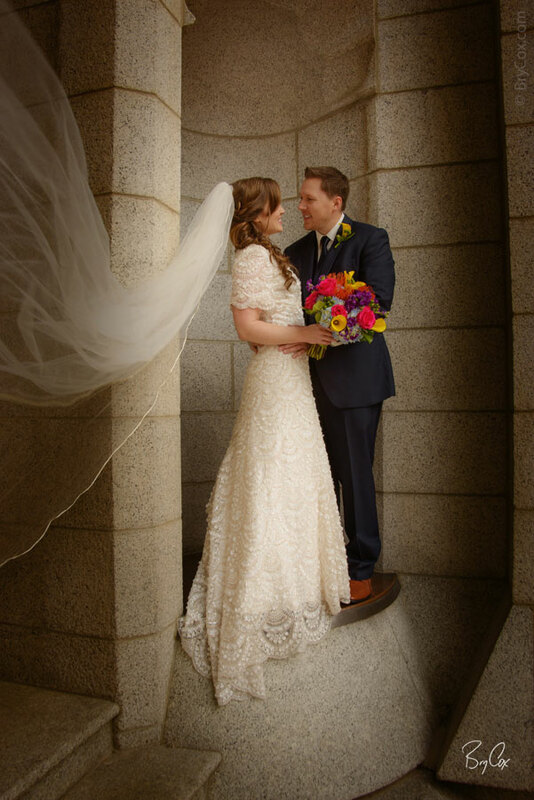 I love these long tall lines mixed with the diagonals of her veil and dress. 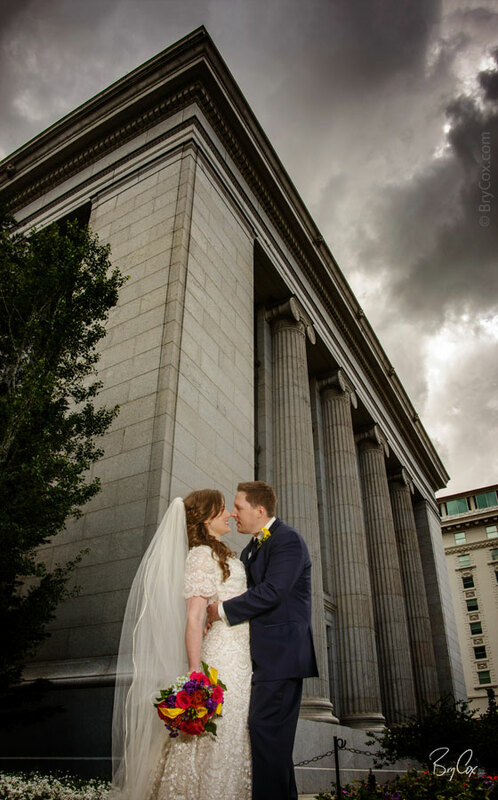 Then just before the reception, these dark clouds started rolling in. I got low to look up to show these deep storm clouds. Then during the reception while we were all inside the JSMB, we got a rain storm for a bit. And to end the night, we came back outside to capture this amazing sunset to end the day. 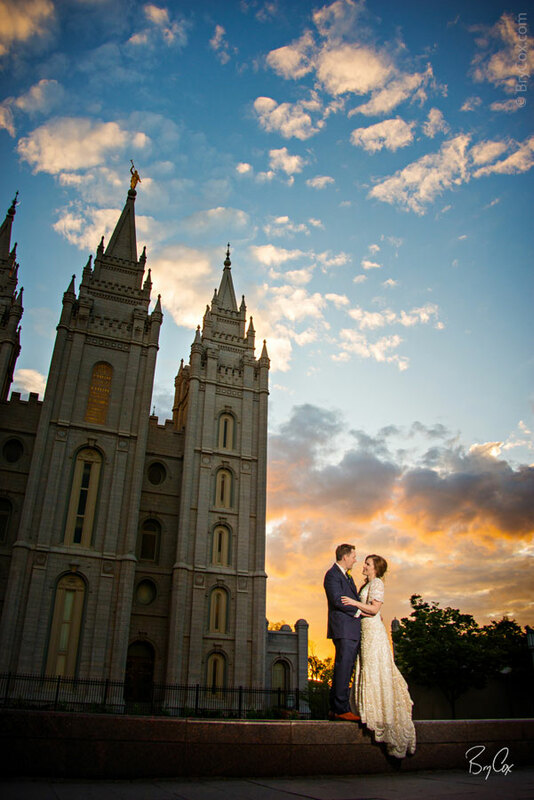 I love warm colors surrounding them, all while being framed by the temple. 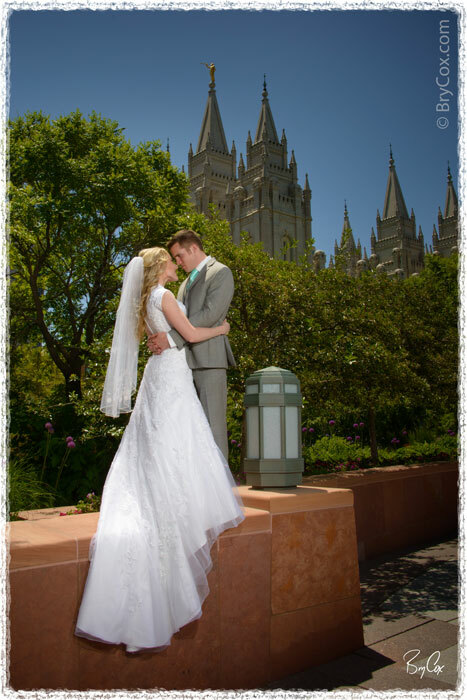 If you’re getting married, give me a call at 801-728-3317. 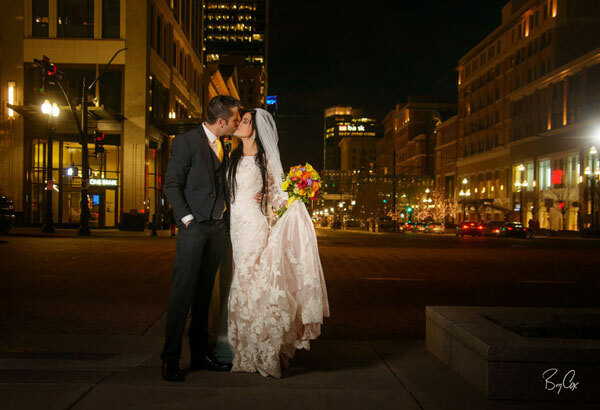 Let’s talk more about your wedding and what you’d like. I’d love to create something awesome like this for you. 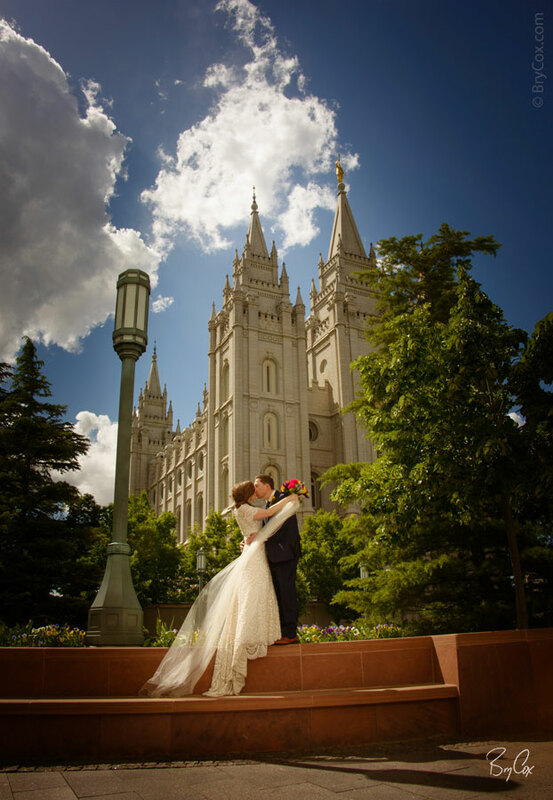 Brittney’s wedding at the Salt Lake Temple here in Utah was absolutely gorgeous. 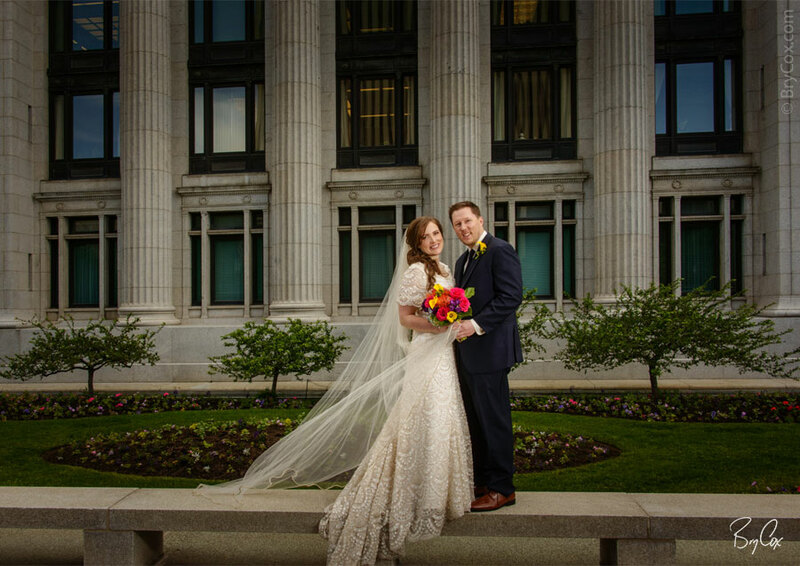 She had her reception at the JSMB (Joseph Smith Memorial Building), and those night images are also stunning. 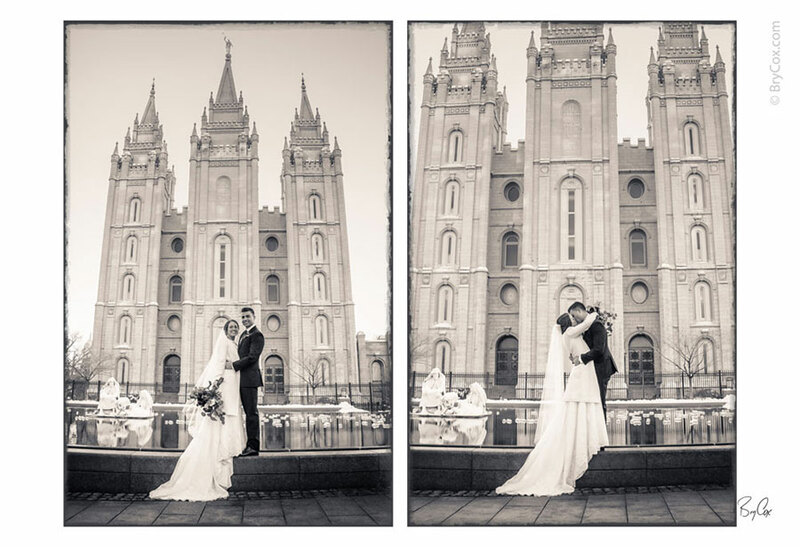 You have to see these early sneak peek of some of my favorites that are in her final wedding album design. As you can see, these two are great together. 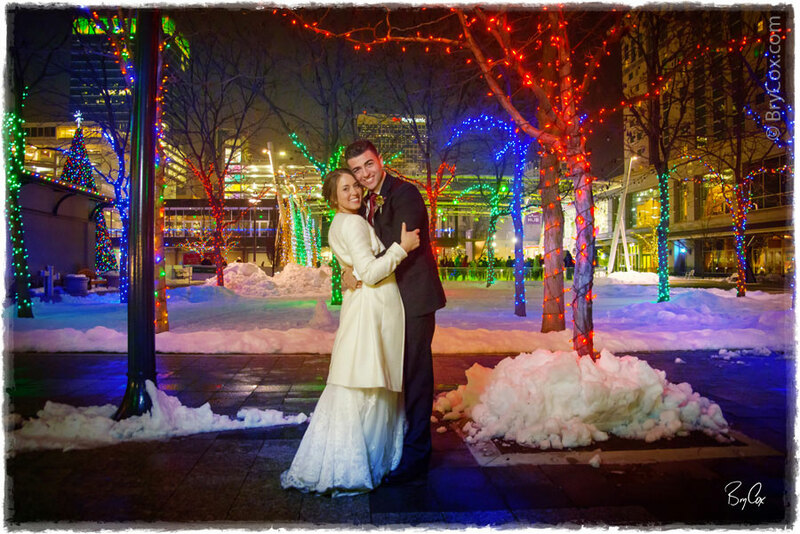 The day was wonderful and emotional, and with some mobile custom lighting, the images have pop and impact. The colors and tones are deep and vivid, and the images are romantic and look wonderful. 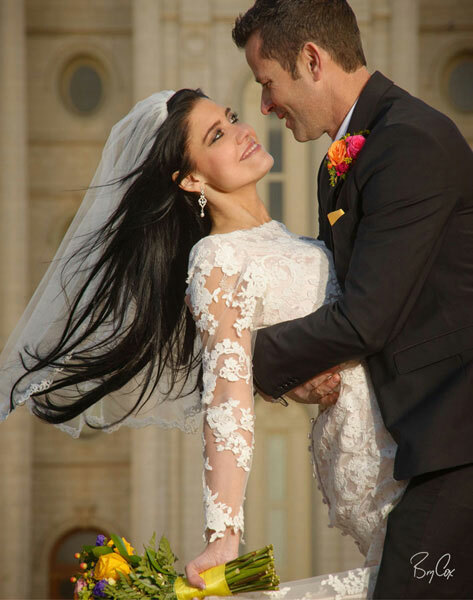 This next image with Brittney’s hair blowing beautifully was our pick for the album cover image. And I especially love this one of them dancing. 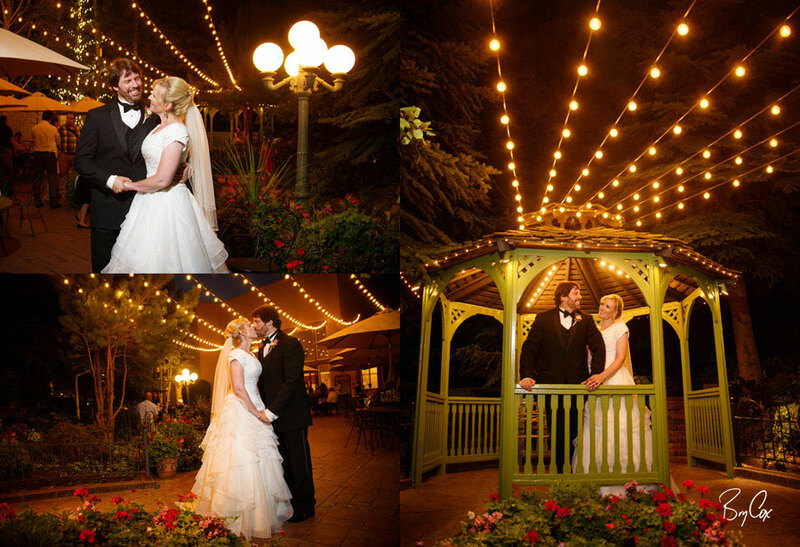 On the evening of the reception, we did some night portraits outside, and here are some of my favorites. The final album looks amazing, and I’ll share that entire design soon. But for now I wanted you all to see these. If you’re getting married or know someone who is, send them my information. Or you can give me a call at 801-728-3317. I’d love to create something amazing for you and for your family history. One of my favorite parts of a wedding is delivering the final album to my clients. After all the countless hours of photography, retouching, and design, there is nothing as dramatic and impactful as seeing the images in their final physical form. 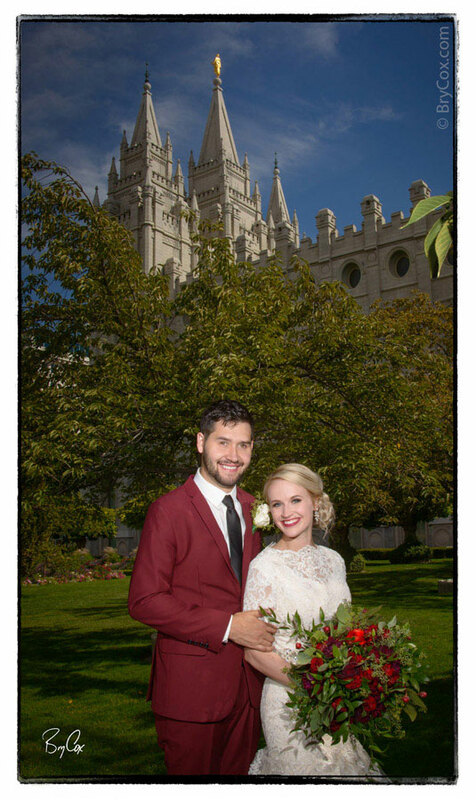 My award-winning wedding albums are the finest available. They’re best seen in person to fully appreciate them because the images are crystal clear and jump off the page. Hopefully you can get a good idea watching this video where I share both Audrey’s abstract painted canvas as well as every page of her album design. 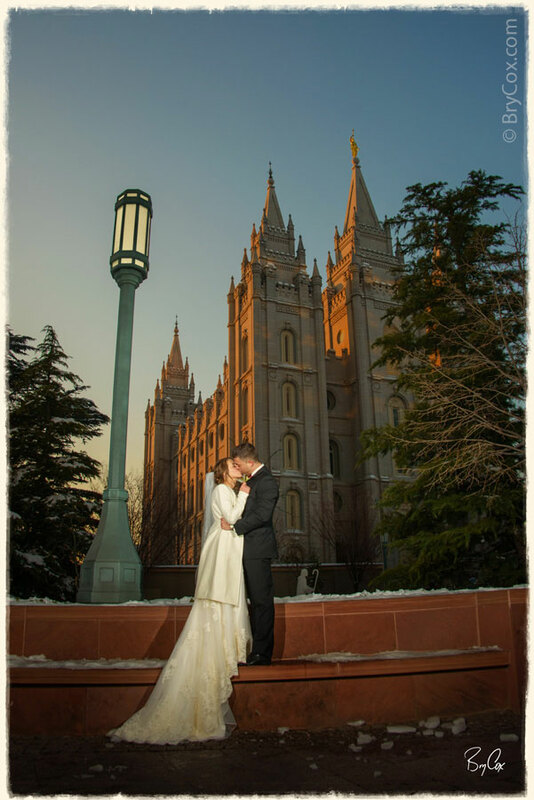 This wedding was on a frigid winter day at the Salt Lake City LDS Temple in Utah. You’ll notice too that we have a variety of lighting conditions from indoors, outdoors, sunny, shade, sunset, twilight, and even nighttime. 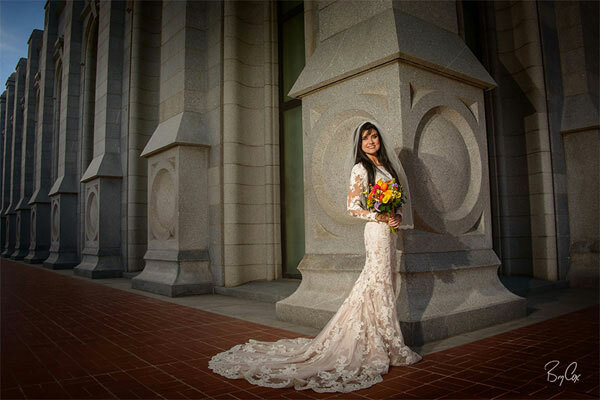 Most photographers are unable to shoot consistently in varying lighting conditions, yet here you’ll notice that we have great skin tones, wonderfully deep skies and backgrounds, and romantic expressions throughout. Every image and page of her album is impactful and tells the story of their day. In the video I zoom in on her painted canvas to show the brush strokes, and here is the painting below. I love creating unique pieces of personal art for people, and this is going to look so beautiful in their home for many years to come. I’m so excited to deliver everything to Audrey. 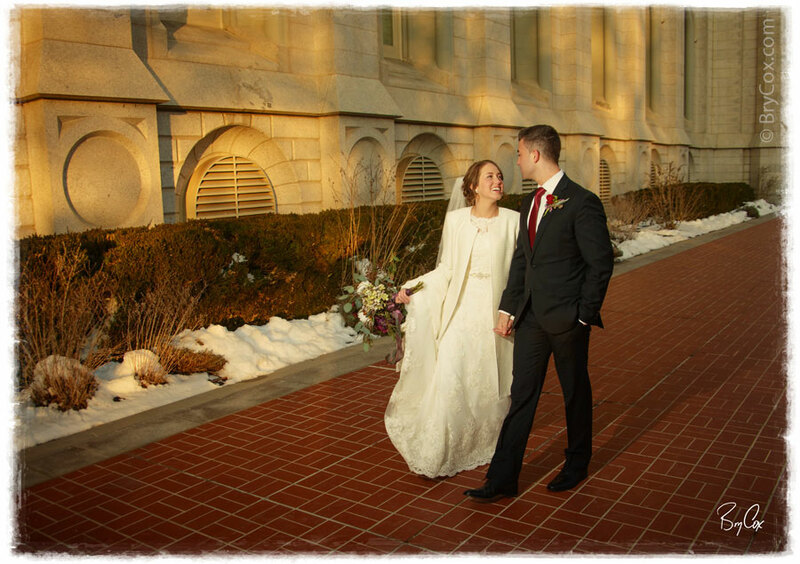 Her wedding was so romantic and gorgeous and we had so many wonderful photographs to design her album with, that you can hardly tell the day was frigid cold. 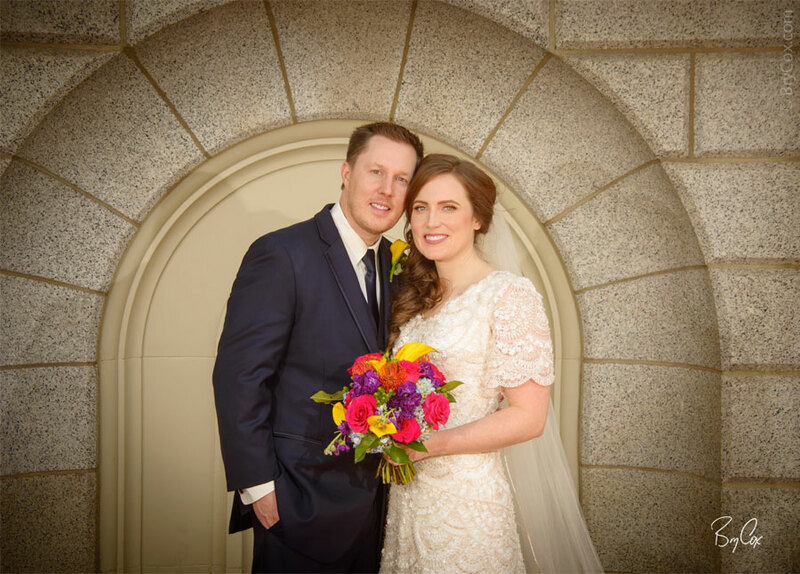 You may have seen some of the early favorites on my blog and Instagram from her wedding, and I think it’s even better to see how the entire wedding collection came together in it’s final presentation. Below are some of her page designs though you can see them in HD using the video above too. 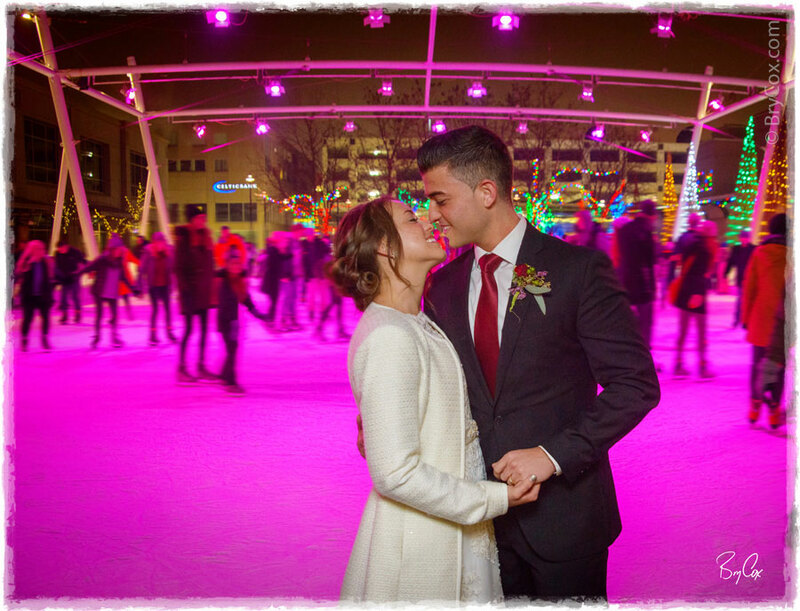 You’ll notice ice skaters from the Gallivan Center ice rink in the video too. Audrey’s reception was next door and the skating rink and it’s vivid colors made for a great backdrop. If you’re getting married, I’d love to create something like this for you too. Give me a call at 801-728-3317. 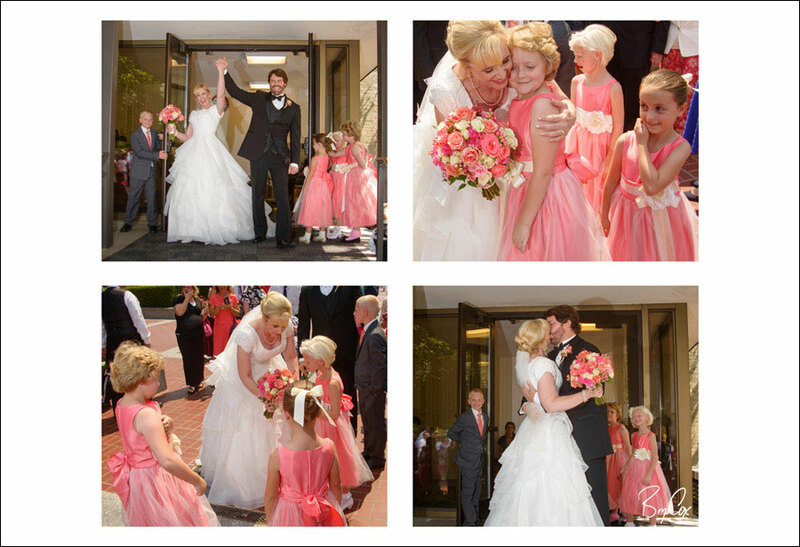 I love photographing weddings, and this one was extra special. It was emotional, touching, and beautiful. 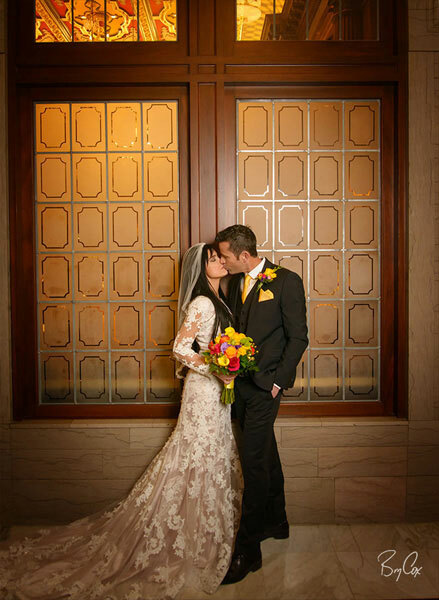 I’m so glad Audrey and Juan found each other and I’m honored to have been a part of their big day. 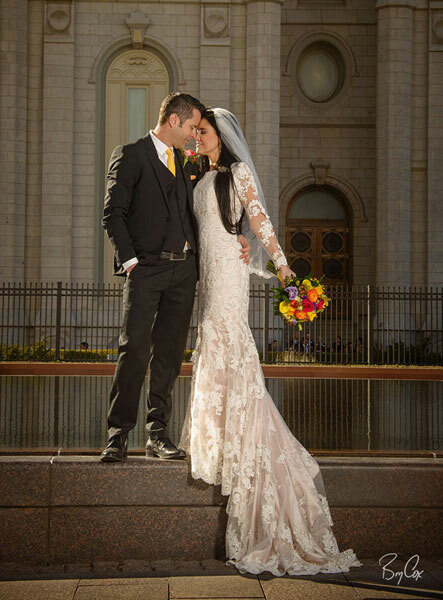 We’ve had some frigid days this last week here in Utah, and Audrey and Juan’s day was no different. Yet with the right lighting, it all looks beautiful and you can’t even tell it’s 17º plus a wind chill. 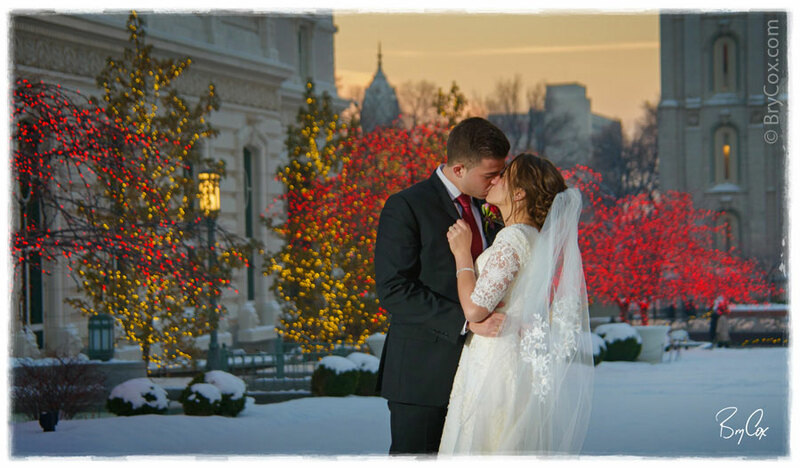 I wanted you to see en early sneak peek of some of my favorite images, like this first one where the colored Christmas lights and the twilight sky made for a very magical backdrop to this kiss. Here’s are a few at sunset, just before the lights came on. 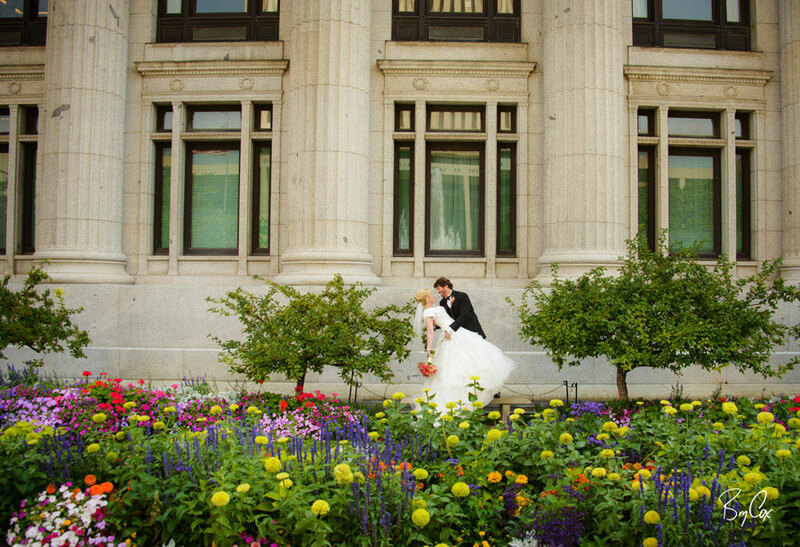 Their wedding dinner was at the Salt Lake Marriott City Center, overlooking the skating rink at the Gallivan Center. We popped down there for a few colorful images. 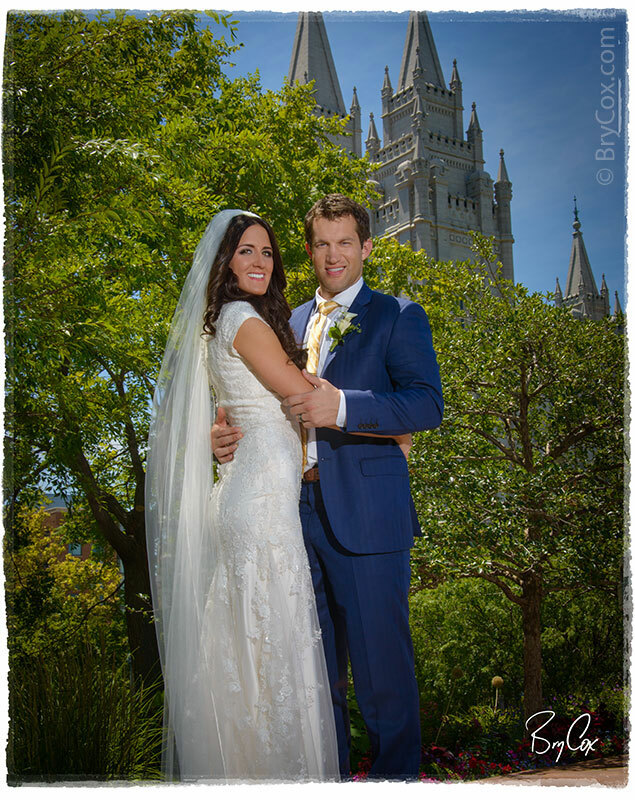 It was such a pleasure to work with these two and their family. 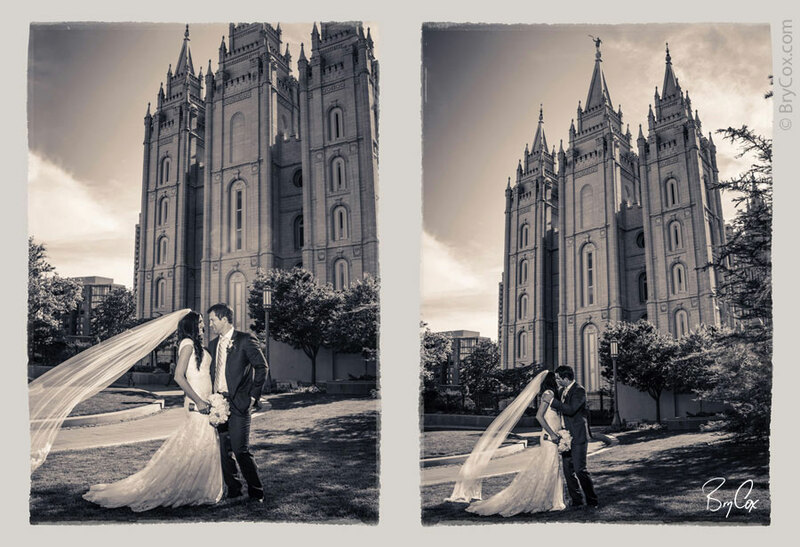 I can’t wait to finish their wedding album, and when I do, I’ll share it here. 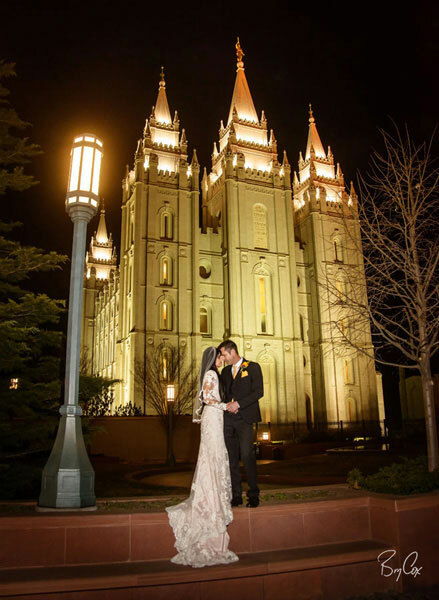 You can also check out their engagements, posted previously. 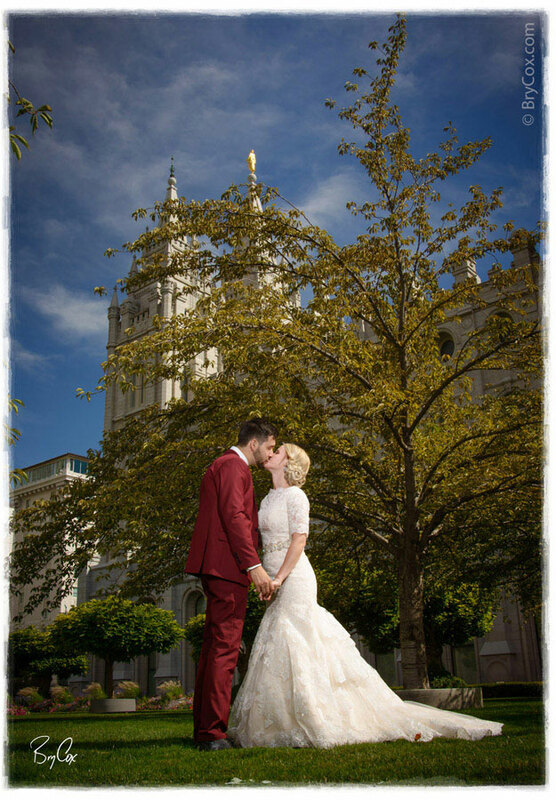 And if you’re getting married, give me a call and let’s talk more about your dream portraits. 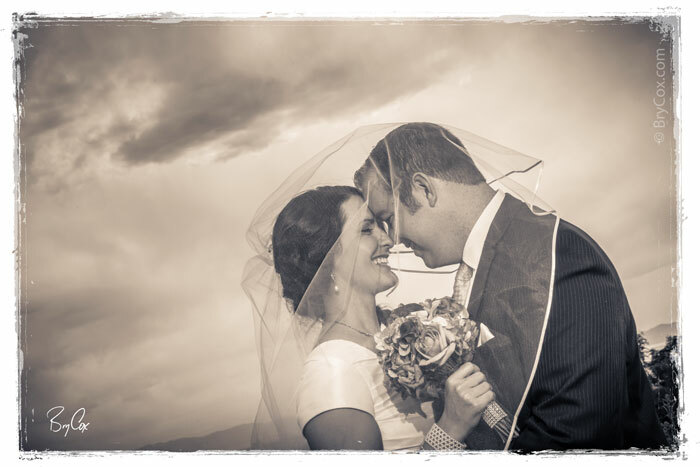 This week I photographed a beautiful wedding for Nate and Kaylie. Here are just some early previews of some of my favorite images. 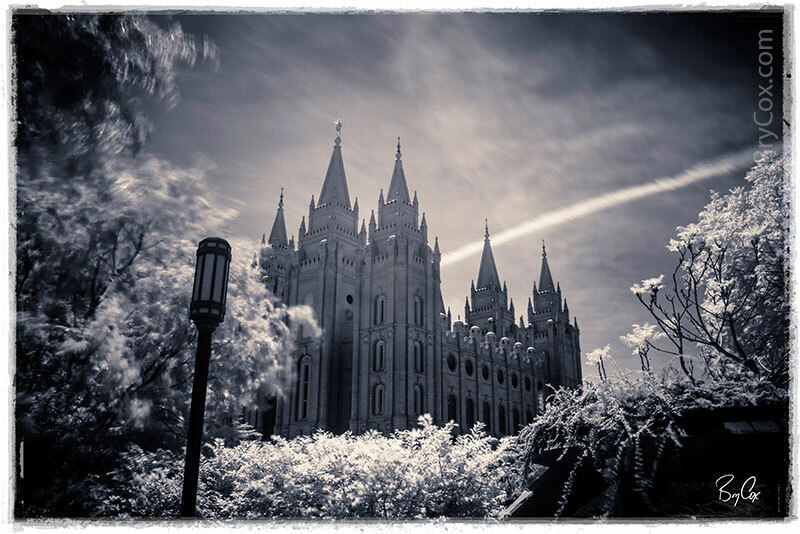 It was a beautiful afternoon at the Salt Lake LDS Temple in Utah. 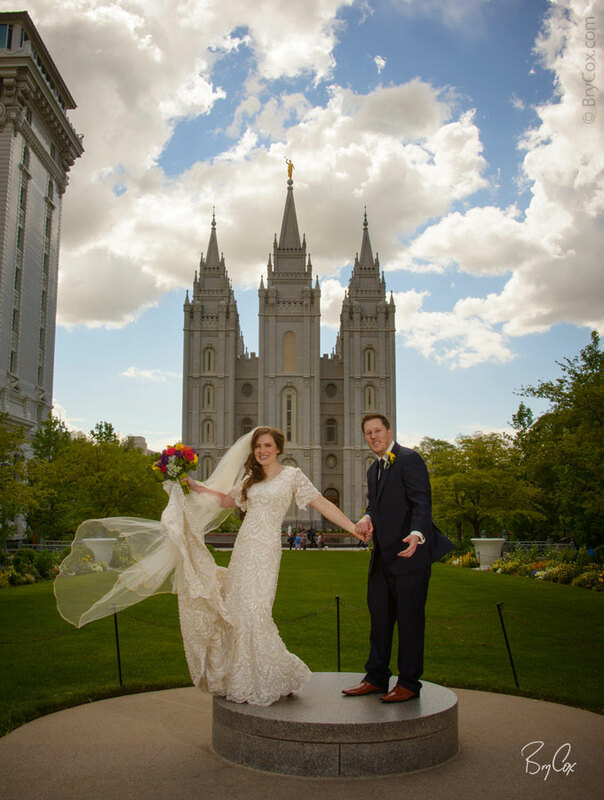 I wanted to show the vivid colors of Nate’s custom suit, the details Kaylie’s beautiful dress, while also getting the deep blue sky and the temple to all show. So with some custom lighting techniques, the colors of the day all come together beautifully in these images. And you can see how happy they look together. 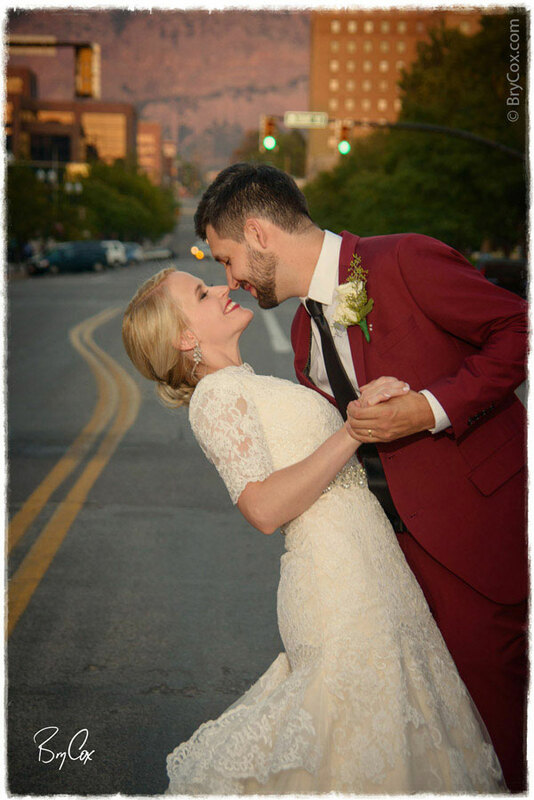 Their reception was held at the Copper Nickel in downtown Ogden, Utah. It was right in the heart of the historic area, where there are wonderful brick alleys and cool spots to shoot. 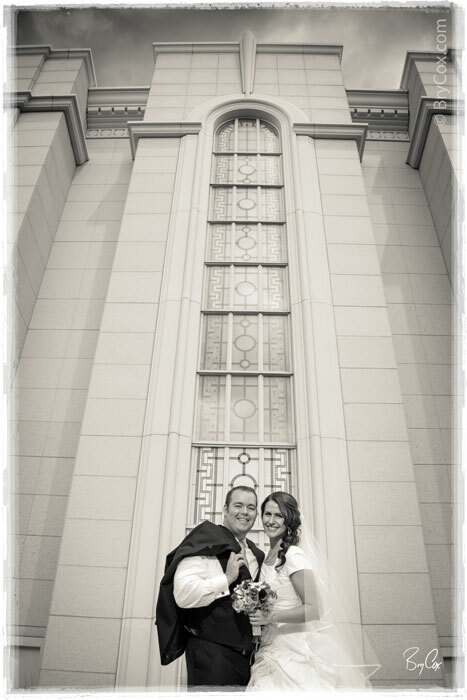 I pulled them away from the reception for a few fun photos in the area. Their wedding will make a great album. And I hope these two and their family enjoy these images for many years to come. 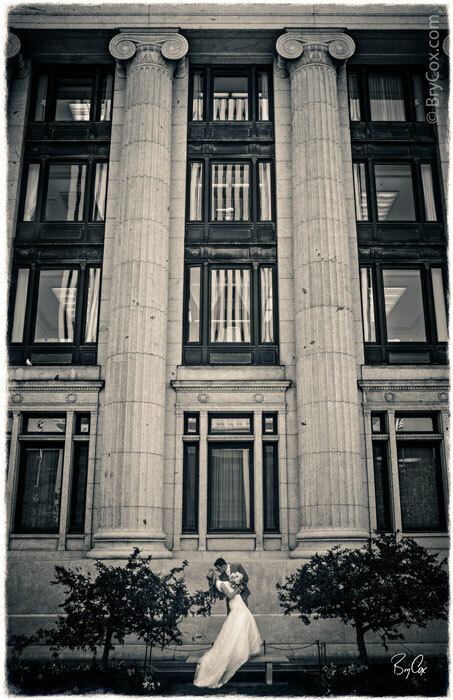 Last year today, I was shooting a beautiful wedding on a very hot day. It was 106º and we had beautiful blue skies and wonderful, vivid summer colors. 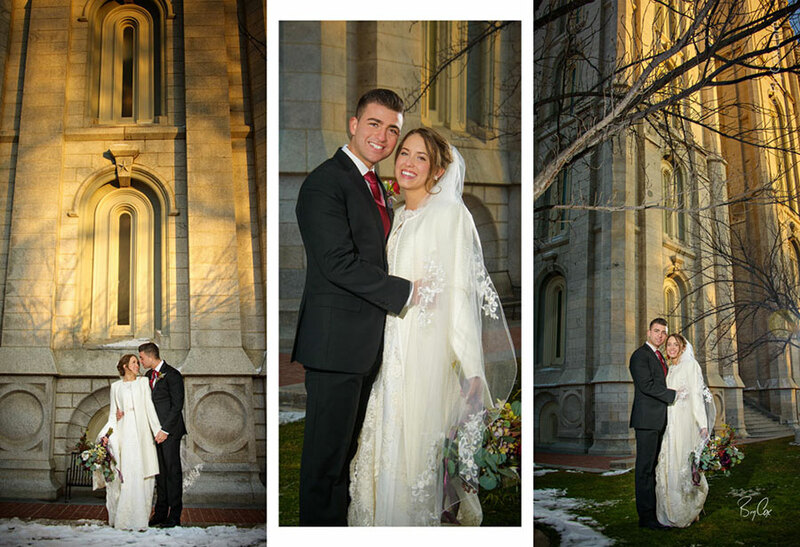 Lindsey and Josh were happy and excited to be married, and the wedding shoot went beautifully. 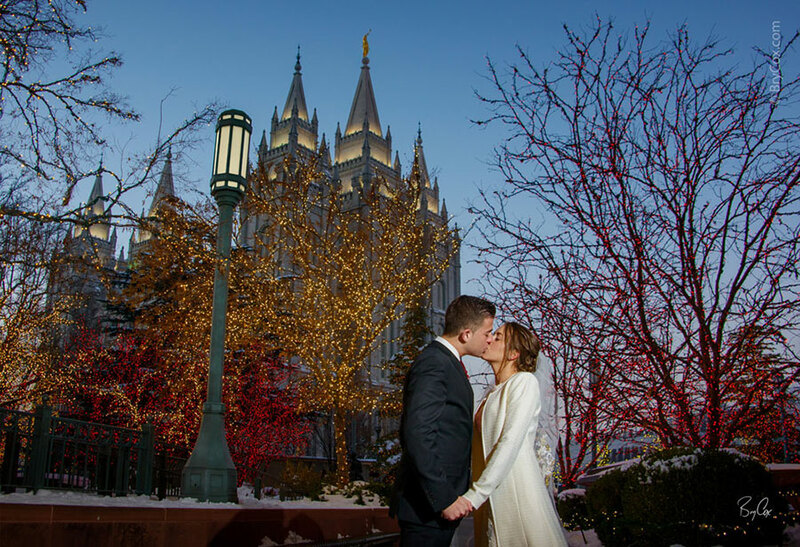 I know these two have had a happy first year of marriage, and I’m grateful to have been a part of their day to create these romantic images for them. Their entire album turned out beautifully. If you want to see her entire album here’s a link to the post where I have a video showing every page. 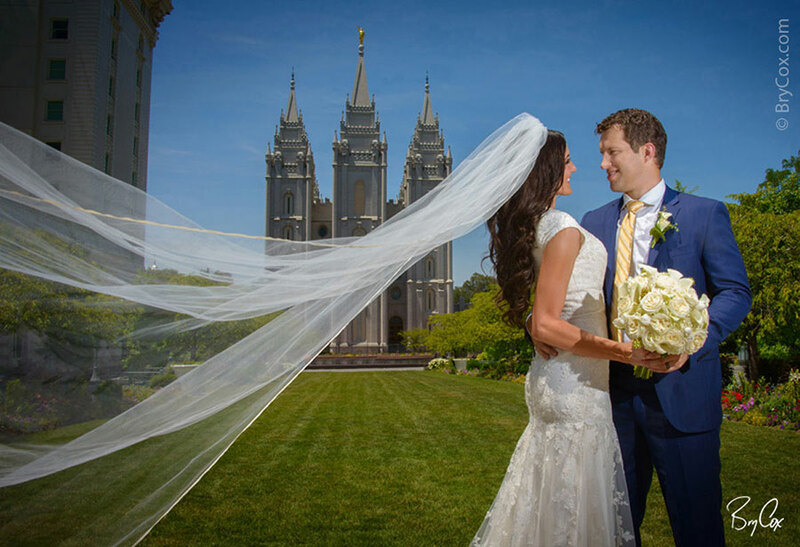 And if you’re getting married, give me a call at 801-728-3317. I’d love to create something wonderful for you. I’ve been so busy I haven’t had a chance to get this on my blog, but I’ve been excited to do so because the final album is so gorgeous. I even shot a video so that you all could see it properly, page by page. 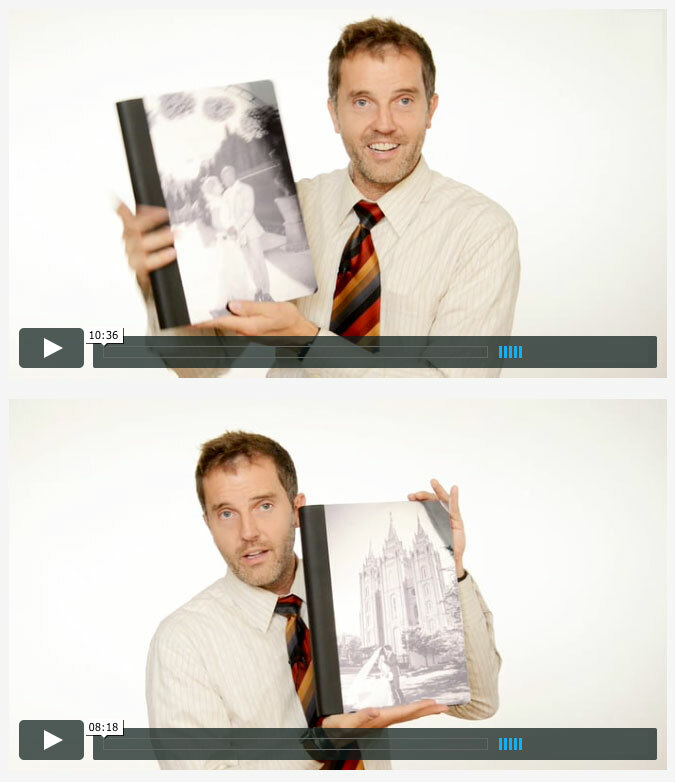 And this video leads off the last video in my last blog post where I talk about what’s different about by wedding albums and photographic approach. So here’s Lindsey’s album. I posted about this wedding briefly when I first shot it, sharing a sneak peek, but wanted you to see the entire album. These guys look so good together, and Lindsey’s dress is quite stunning on her, as you can see from these album page design spreads. 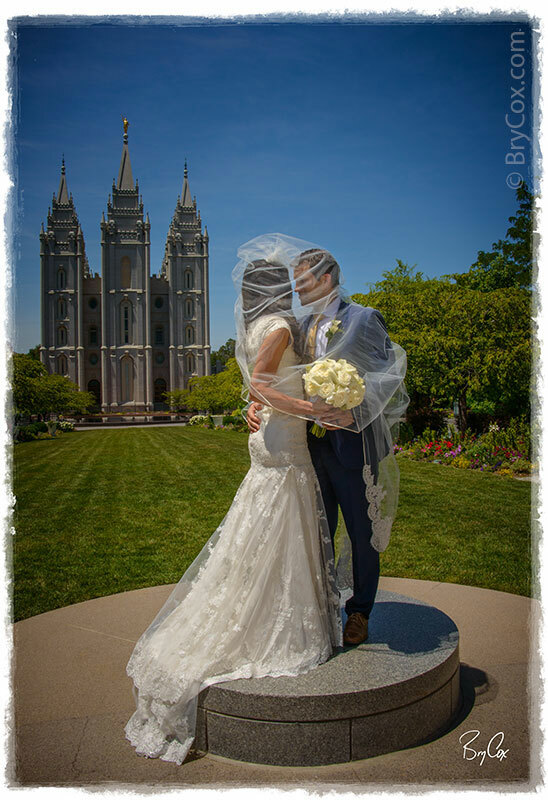 This wedding was on a very hot day, over 100º at the Salt Lake Temple. 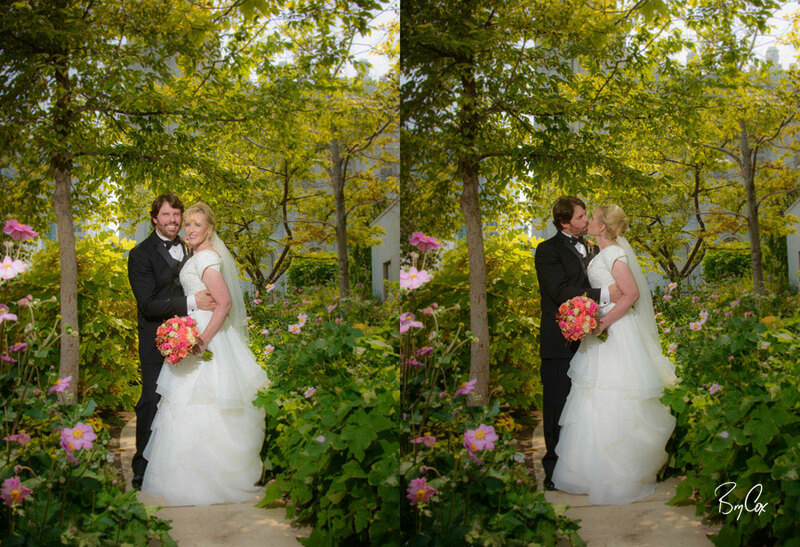 Most photographers today can’t shoot in direct or hot sunlight without getting white skies or dark eyes. 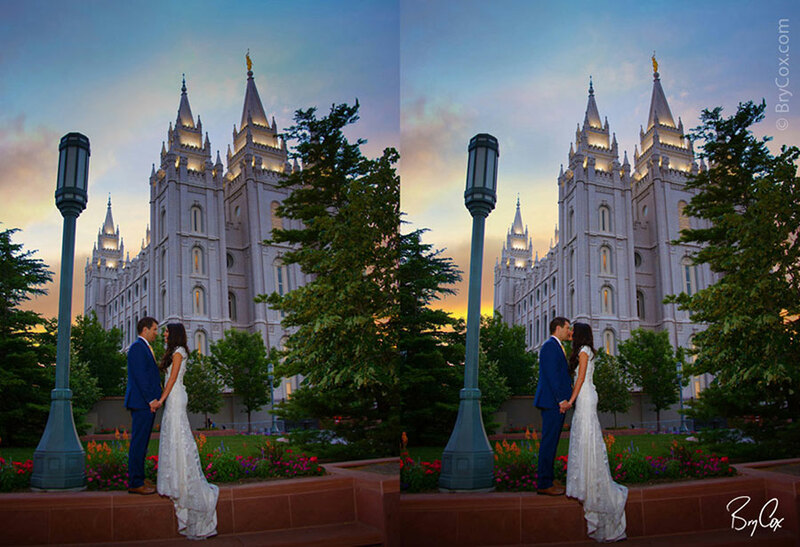 But compare that common look to these images with the right lighting approach, it made for very dramatic skies and punchy colors and the couple always looks amazing. But they are a great looking couple and had great chemistry that day. And I love these twilight images too, just as the sun was setting. Wow! 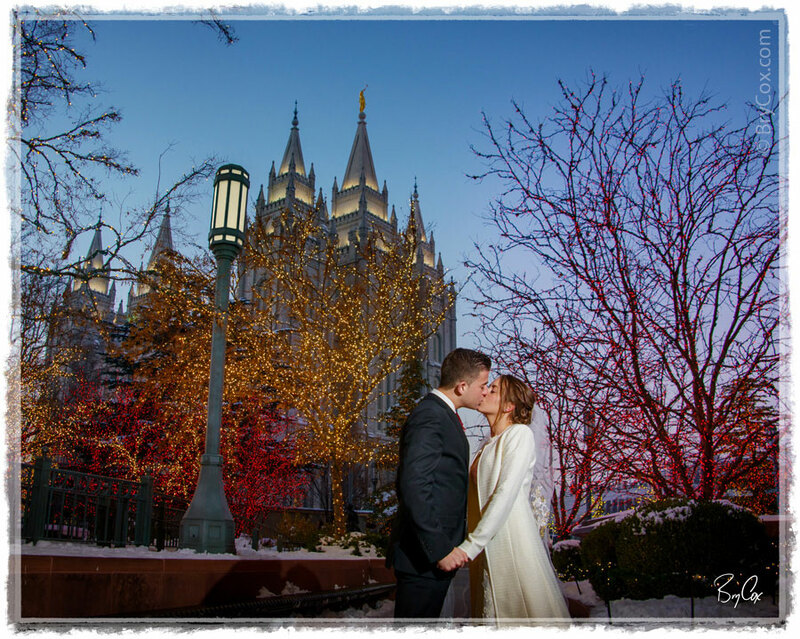 If you are getting married and want the best possible romantic and beautifully lit photographs possible, give me a call at 801-728-3317 and let’s talk more about your dream day. 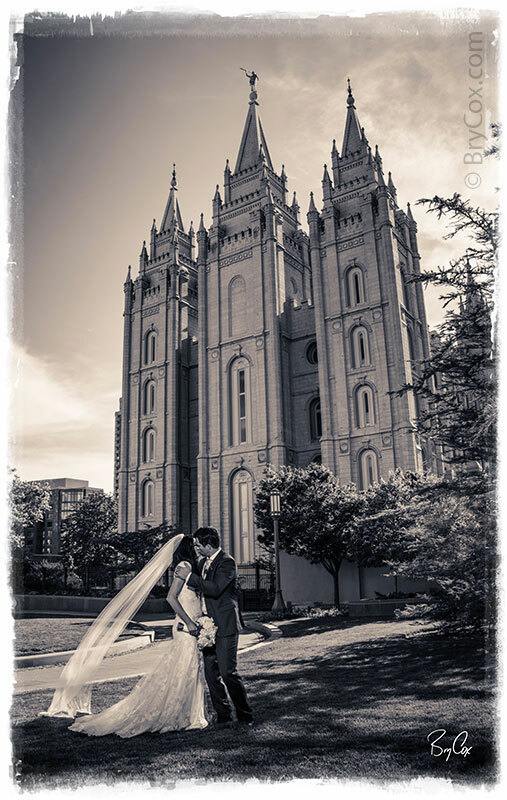 I am finishing up and shipping out a lot of wedding albums right now, and Kamberlyn’s album is one I must share. 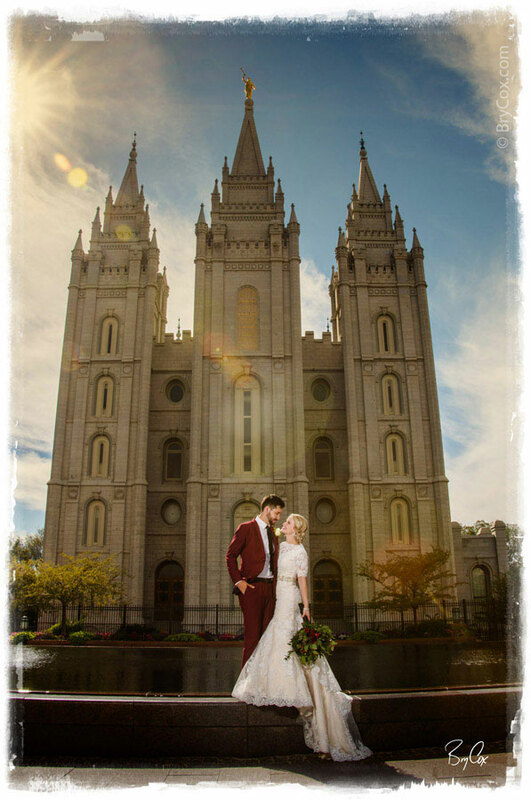 Ever since I posted the sneak peek of her wedding, people have been talking about these images. Here are a few of them again. Most photographers see weather as something that must be avoided, but I love it. It gives me a chance to really stand out and use creative lighting and posing in creative ways for really impactful images. And this windy day of Kami’s made for a lot of impact and emotion throughout the album. Plus this couple is a dance team, and you can see the chemistry between them. So here is her entire album design, shown as a slideshow to music, with each double-page spread shown as a slide. 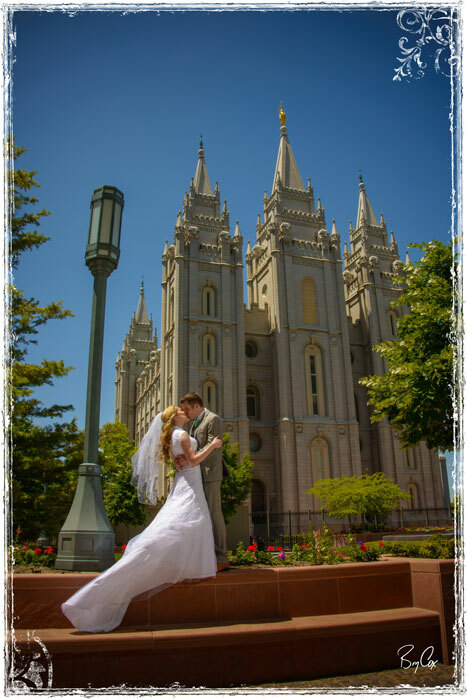 The wedding starts at the Salt Lake Temple, continues on with lots of romantic couple portraits, before going across the street to the City Creek for the reception. Hopefully you notice the artistry, the clarity, the romance, the weather, the dancing skills, and what a beautiful day this is. And here is how my albums look when they are finished. 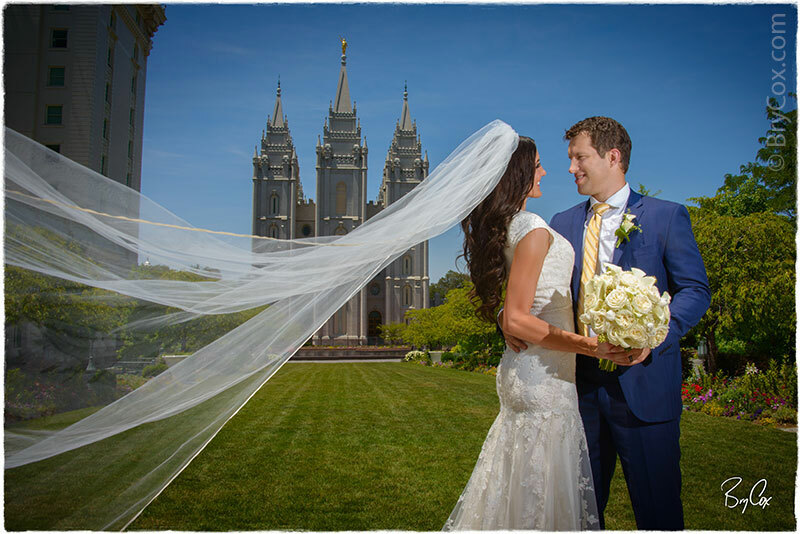 I photographed Josi’s wedding at the Salt Lake LDS Temple and it was a gorgeous and hot day, and I wanted to share with you some early images as a sneak peek before the album is finished. 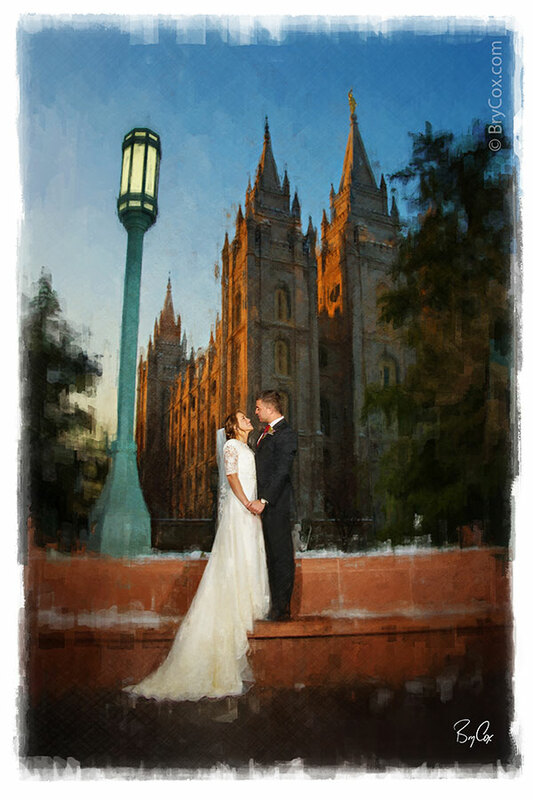 I like to start off my album designs with a really cool art piece of the wedding location. 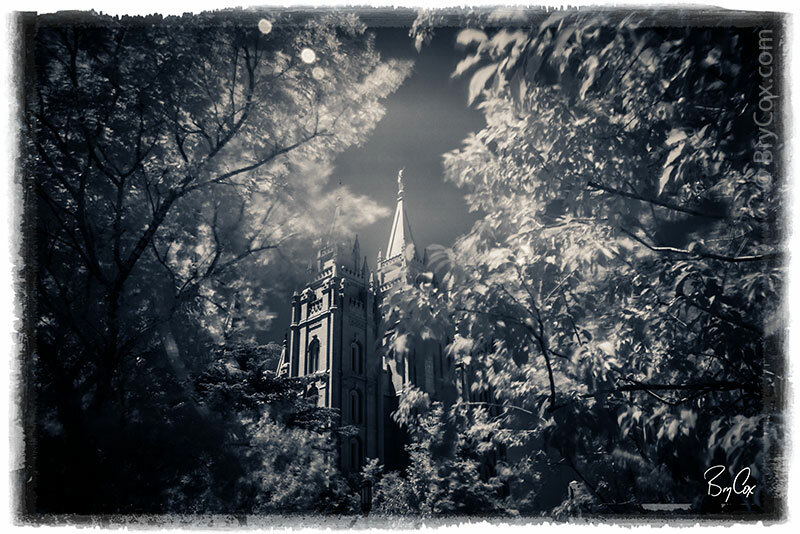 So while waiting for the couple to come out on this hot day, I went with a dark sky and this black & white image of the temple. 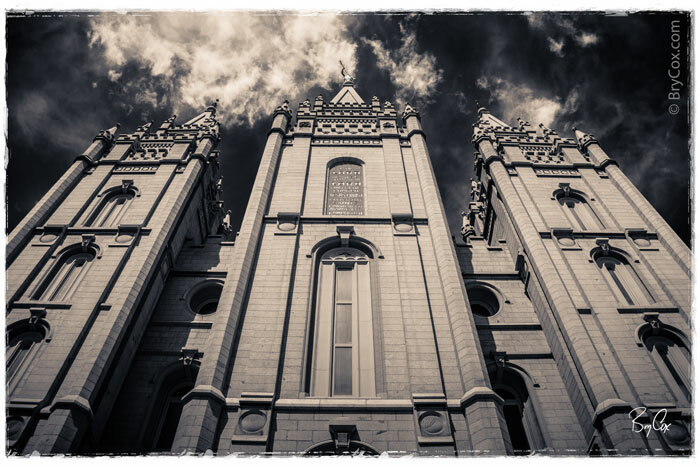 I like the shapes and wispiness of the clouds mixed with the solid lines of the temple. When the couple came out, we created various group portraits, then left the group to focus on just the couple before their luncheon. 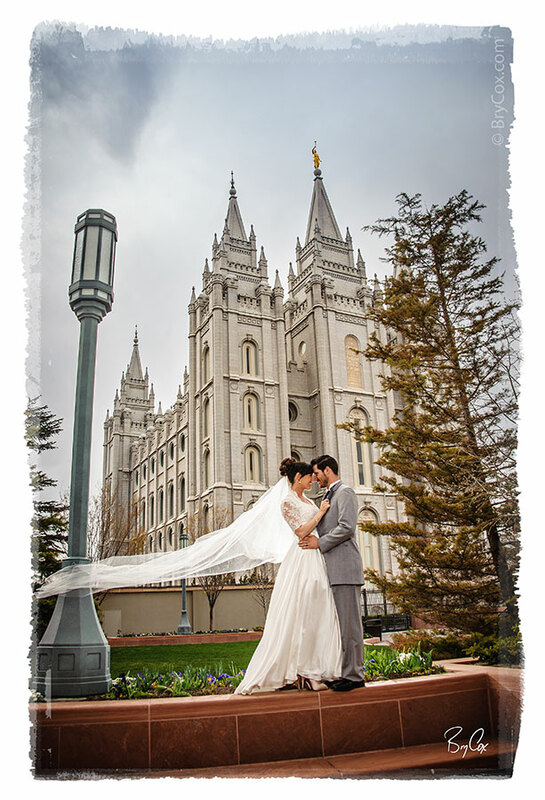 We went all over the temple grounds creating images. Here are some of my favorites. A nice warm day with the right use of lighting means a deep, dark blue sky and vivid greens. 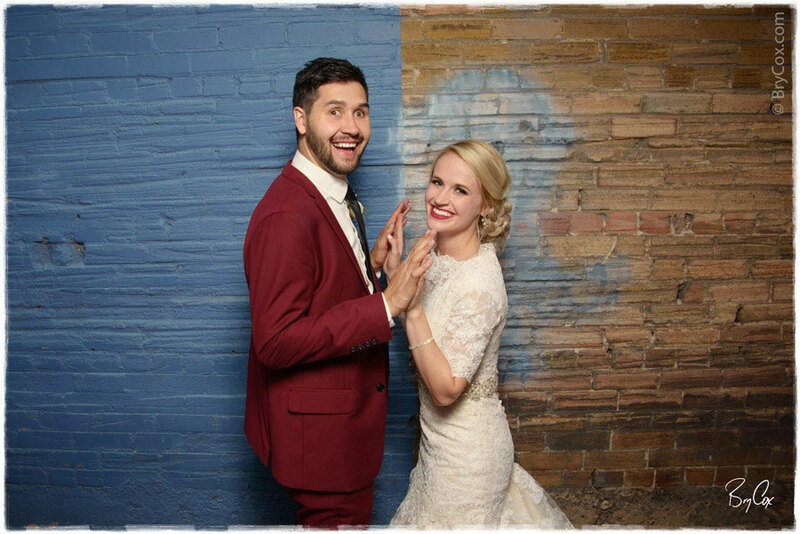 Mix that with a beautiful couple and some romantic compositions and we have these stark and gorgeous wedding portraits. I myself would never use the word, “coloring,” but I get what they are trying to say. Other photographers create images that feel flat, they then add skin retouching and effects that make people look like fake rubber. In contrast, none of these images have any skin retouching or effects. They are real images created with great lighting, and my techniques mean images that feel three-dimensional, with colors that pop, and a feeling of complete reality if not being romantically surreal. The wind was kicking in here and there throughout the shoot, and I think wind adds romance to a portrait. 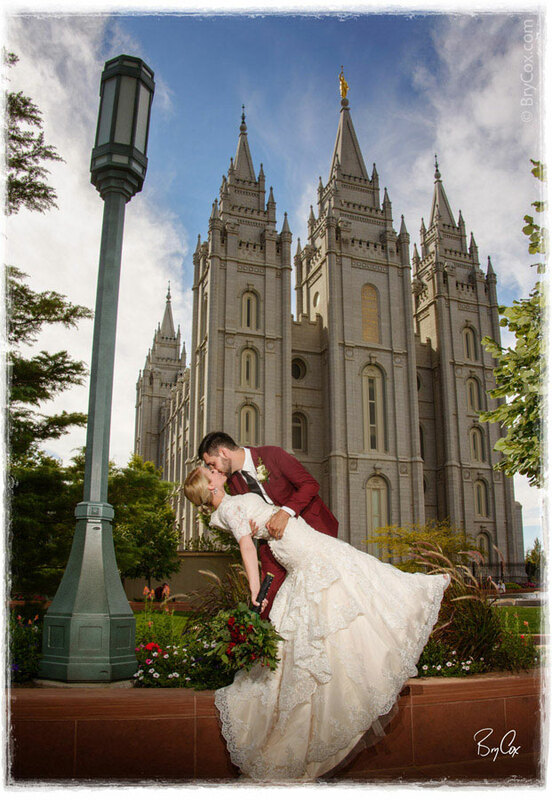 So after getting set up in this spot I had them hold their kiss, waiting for the wind to move her dress in just the right way. And I really like this dip with this graphic and symmetrical background. 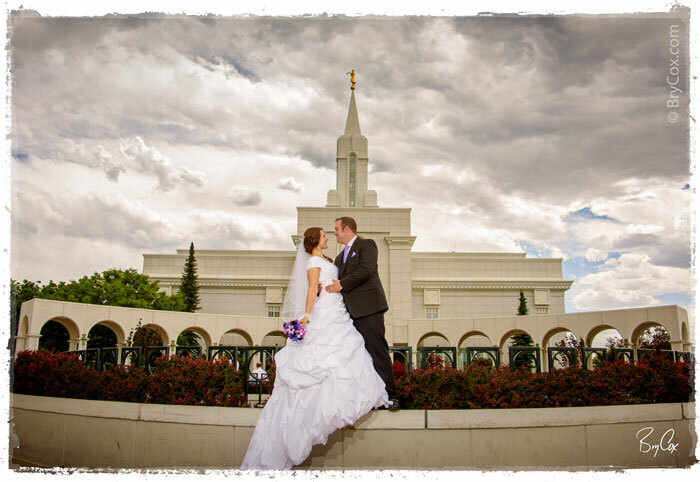 My studio is located in Utah outside of Salt Lake City in Davis County. I do work all over Utah and the United States however, and can give you an idea of price over the phone. 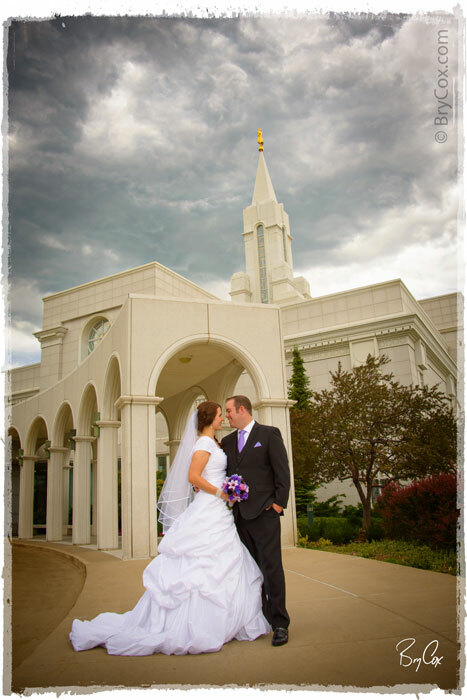 I just photographed Janae’s wedding at the Bountiful Utah LDS temple. Being late spring/early summer, we had some awesome storm clouds. That meant that with the right lighting, I could create dramatic images with this awesome sky. 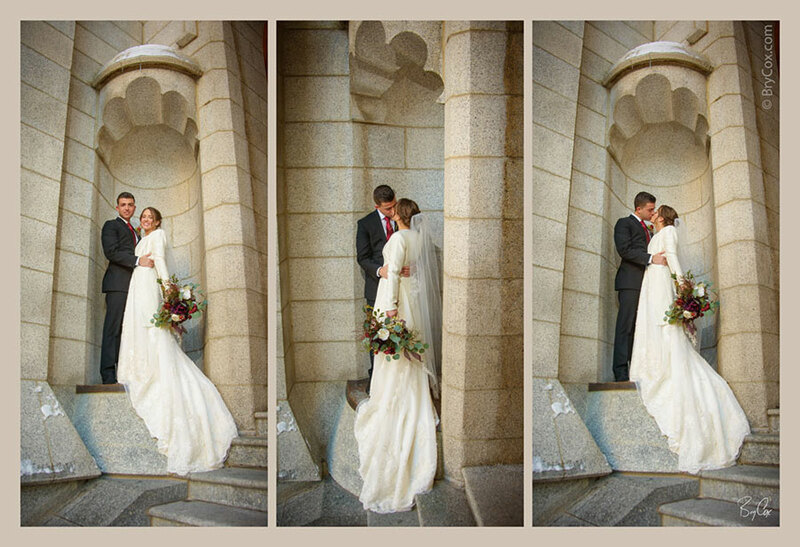 It was an exciting day to be out photographing a wedding. And here are some early images for you all to see. Even if you don’t know this couple, you can tell that they are great together. They were happy to be with each other and were very photogenic. It made for some amazing images. 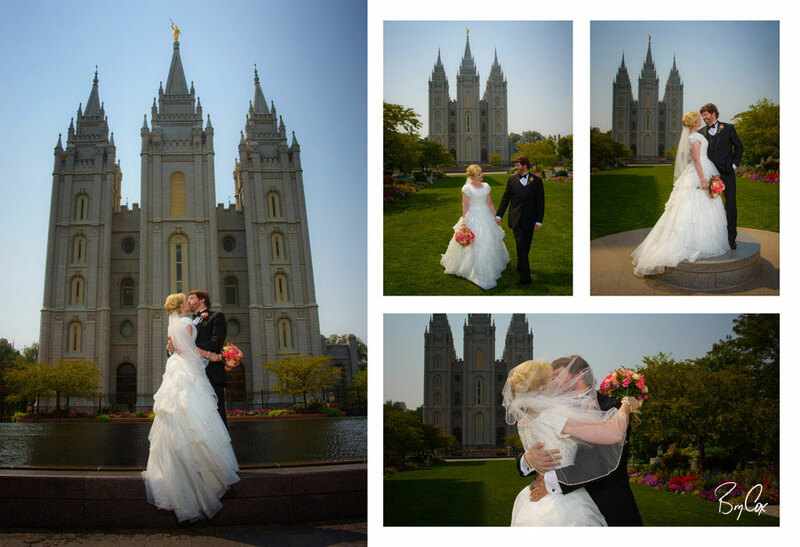 As you can see from these early previews, the wedding was phenomenal. I can’t wait to finish this album design. I love the romance and feeling in these images and can imagine any of these as beautiful wall prints. 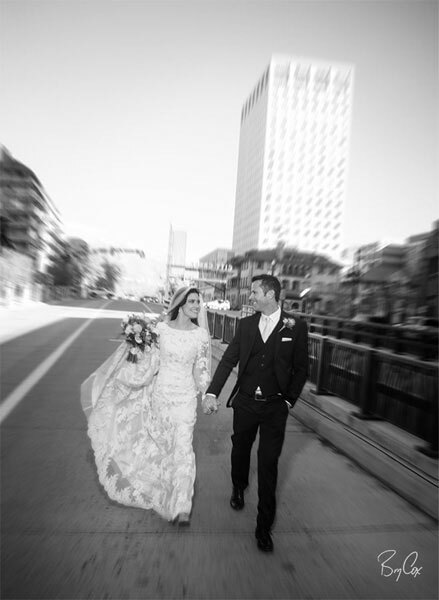 The actual wedding album design takes a while because of the level of quality that I produce. Nevertheless when it is done, I will post about it here too. 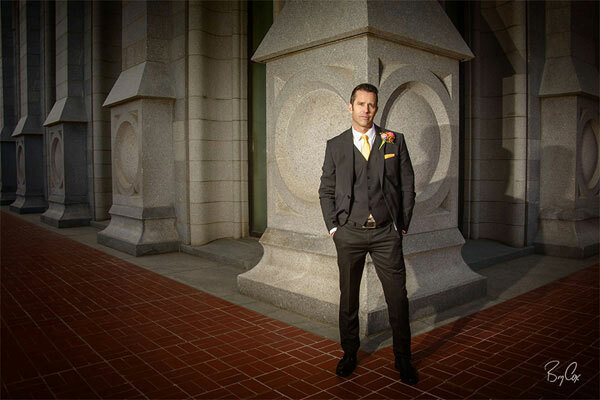 But in the meantime, you can check out this couple’s bridals shoot that included the groom. Just a few days before the wedding, the bride flew into town and we squeezed in a quick shoot that I posted here on my blog.